5.20 points at 15 votes (rank 753). 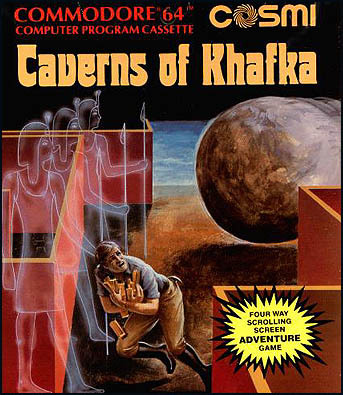 Find 5 holy seals in a labyrinth and attach them to the gate at the temple of Pharao Khafka to open the gate. Enter the tomb, outwit the ghost guards and get the treasure. . . . . This sounds easy, but it is not, because the people of the pharao does not live any more but all lockings and traps still work well. Furthermore, evil bugs, rolling and falling rocks, magma and bats obstruct the search. And finally, some tunnels and channels are very narrow so that our brave treasure hunter (or tomb raider) must crawl through them to avoid hurting his head. In the unlikely event that you find all seals and get to the guards of the treasure, the most dagnerous task will follow, as you need to pass the guard without touching it. If this succeeds the adventurer will be awarded the Treasure of the Pharao, if not he will die a cruel death. . . Simple, functionally kept graphics with light colours and partially slightly jerky scrolling into all eight directions. The music and FX, however, fit each corresponding game situation well. Seals can be collected by walking over them or also by touching them with the rope. A beep sound signals that a seal is close. After collecting a seal you are invulnerable for a short time span. You can always carry only one seal. In the lowest level, left of the lift there is the door of the temple into which the seals must be put (joystick back and fire button). When all 5 seals have been inserted, a trap door to the tomb will open. Avoid any contact to the ghosts in the tomb and walk directly to the front side of the Sphinx. Pressing the RUN/STOP key pauses the game. To continue press this key again. The joystick needs to be pressed into the corresponding direction until the movement is complete or until you want to stop. The two stars in the following display (**) indicate, that the fire button needs to be pressed to do this action. A small tip: Our hero is very sensible to head contact with stone and immediately passes out and does not move until you move the joystick again. The annoying thing is that if this happens in a low tunnel, he will bump his head again when getting up and this will repeat until he has lost a life. Therefore, in such a case you better get up with joystick doing the crawling movement (joystick diagonally backwards left or right). H.T.W: "The game somehow seems incomplete, as if the programmer was under time pressure. A small example: The idea with the rope that you can use to climb to higher platforms is not bad, but being unable to defend oneself during this action is below every critic. Being able to change the jumping direction during a jump could be a feature, but that you then hit your head on an almost invisible "trash pixel" in the middle of the jump, is unacceptable. The whole controls are, to put it mildly, chaotic and the graphics... well. There is only the sound left and this at least is not disturbing. But critics are subjective opinions and you better test the game yourself." Robotron2084: "The music is the only feature that rescues this game from drowning in the swamp of fast oblivion. Sneaky-threatening at the beginning it merges into a shrill cacophonia when losing a life while getting out of hand. The sound that rings when you get eaten by the Sphinx should be more than enough to deeply unsettle a sensitive mind. 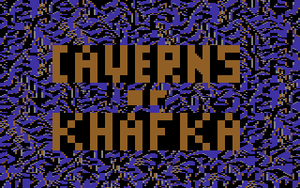 So during a nice retro Sunday afternoon, just play "Caverns of Khafka" with a relative's child and best switch the light off. Have fun! By the way, you can forget the game in other respects. 5 out of 10 points." Klaws: "Well the graphics are rather cruel, but this did not keep me from giving the game a chance. Apart from the graphics, I also noticed the music (which is supposed to make for a gloomy atmosphere - therefore fitting the game, but nothing which I would want to hear on the radio) and the impressive size of the area to be searched. This made me hope for a game that offers a certain depth and long time motivation. Well. I have realized very quickly that the difficulty grade lies mainly in the art to be able to cope with the controls. This was unnerving. Then I reached a narrow passage with my figure. Correct, if you know the game, you know what comes now: The figure bangs its head constantly until it dies. Ha, ha. Very funny. At least the game has still today some fascination by the size of the game area. Therefore 4 out of 10 points anyway. But not more - because even though I speak about a certain fascination, I only have to think about the controls and the 'permanent dying' to nip any thought about another try in the bud."